ST. JOHN was born in 1419 at St. Fagondez, Spain. At an early age he held several benefices in the diocese of Burgos, till the reproaches of his conscience forced him to resign them all except one chapel, where he said Mass daily, preached, and catechized. After this he studied theology at Salamanca, and then labored for some time as a most devoted missionary priest. 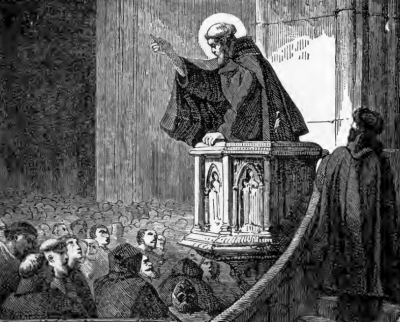 Ultimately he became a hermit of the Augustinian Order, in the same city. There his life was marked by a singular devotion to the Holy Mass. Each night after Matins he remained in prayer till the hour of celebration, when he offered the Adorable Sacrifice with the most tender piety, often enjoying the sight of Jesus in glory, and holding sweet colloquies with Him. The power of his personal holiness was seen in his preaching, which produced a complete reformation in Salamanca. He had a special gift of reconciling differences, and was enabled to put an end to the quarrels and feuds among noblemen, at that period very common and fatal. The boldness shown by St. John in reproving vice endangered his life. A powerful noble, having been corrected by the Saint for oppressing his vassals, sent two assassins to slay him. The holiness of the Saint’s aspect, however, caused by that peace which continually reigned in his soul, struck such awe into their minds that they could not execute their purpose, but humbly besought his forgiveness. And the nobleman himself, falling sick, was brought to repentance, and recovered his health by the prayers of the Saint whom he had endeavored to murder. He was also most zealous in denouncing those hideous vices which are a fruitful source of strife, and it was in defense of holy purity that he met his death. A lady of noble birth but evil life, whose companion in sin St. John had converted, contrived to administer a fatal poison to the Saint. After several months of terrible suffering, borne with unvarying patience, St. John went to his reward on June 11, 1479. Reflection.—All men desire peace, but those alone enjoy it who, like St. John, are completely dead to themselves, and love to bear all things for Christ.